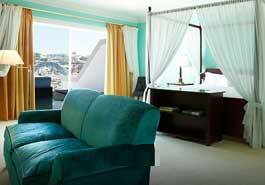 The Presidential Suite of The Yeatman provides an exclusive experience of comfort and luxury. 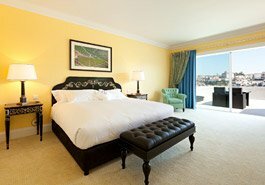 With spectacular views of historic Porto and the river Douro, this two-bedroom suite is designed to offer unforgettable memories. 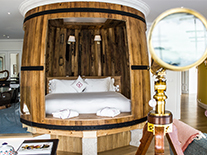 From the Port wine barrel shaped bed to each single detail, it reflects the pure essence of the city’s heritage and culture. 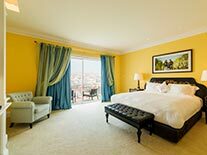 The Presidential suite is one of the brand-new suites of The Yeatman and the most luxurious. With 170 m2 (1,830 sq. ft.), it has its own private swimming pool and garden with panoramic views, offering a relaxing retreat experience. The spacious terrace, with 115m2 (1,238 sq. ft.), is perfect to rest and contemplate the stunning and inspirational scenery shaped by the Porto skyline. You can even observe the city’s exquisite details through the suite’s telescope on a clear day or starry night. 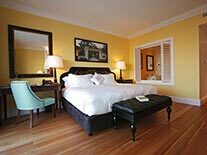 The suite is lavishly designed with two bedrooms, two en-suite bathrooms and two living room areas both providing access to the terrace, garden and pool. To emphasize the sensation of comfort, it has a fireplace, a large copper bathtub, a widescreen television and a service kitchen, that allows the preparation of light meals and refreshments. The lounge area, also with panoramic views, provides a separate area for socializing or a comfy space for the children to play. The Presidential Suite is all about luxurious details. 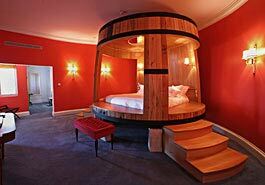 The master bed is carved into a large and masterfully crafted wooden Port barrel. The elegant living areas are decorated in a contemporary classic style to the highest standards of taste and comfort, with refined, soft fabrics in soothing colors. 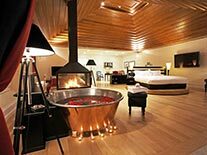 This sumptuous suite is perfect for a family or couples wishing to relax in privacy and for those who wish to receive day guests. 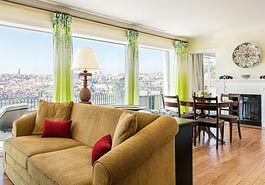 The floor to ceiling views provide plenty of natural light and the elegant furnishings take on a particularly warm and attractive glow in the Porto sunshine. Private Pool Stunning views from your own swimming pool. Barrel Bed Sleep inside a restored Port barrel. Guest Bedroom The Presidential Suite features a second en-suite bedroom.